Canadian researchers Dr. Neil Skjodt and Bill Hodgetss (a pulmonologist and audiologist respectively) from the University of Alberta aim to take advantage of an ordinary MP3 player with built-in microphones by using them as stethoscopes. As everyone knows, most of such devices do not come with a microphone that is worth trumpeting about, but what makes them special is the fact that they are stored within a plastic shell. It is this very plastic cocoon that offers the ability to capture low resonance notes that emanate from your body. Talk about using an everyday peripheral that most people won’t have a second thought about, using it as a medical appliance! Having said that, laypeople like me don’t know that discerning chest or heart sounds through a stethoscope leans more toward the art side than an exact science. Recent studies have revealed surprising results where a number of medical students have to listen to certain clinical sounds up to half a thousand times before they are able to tell the difference. Dr. Neil Skjodt decided to do something about the situation in order to bring about a higher degree of accuracy, and he decided to use lung sounds recorded on an MP3 player in an experiment. 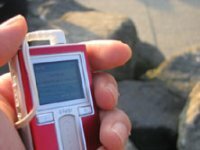 True enough, these MP3 player recorded sounds made it easier for the above mentioned medical students to recognize common combinations of breath sounds. This is not a cure all solution though, as there are still subtle sounds that posed a conundrum. Ultimately, both Skjodt and Hodgetts want to provide subjects with reference recordings, including a library of chest sounds in the MP3 file format in order to help students differentiate one from the other. It is also hoped that these MP3 players can help doctors listen for heart and bowel sounds. Heck, you can even upload a certain recorded sound to the Internet and get help from experts all over the world, while the more forgetful medical students can use this as a portable voice recorder. I’ll never look at another MP3 player in disdain ever again. The Creative Zen Vision:M comes with a built-in Microphone, which has been found to work well. Also, the Zen V+, Zen Wav and the new ZEN also include a built-in Microphone.